Cakes for all occasion or for all reason! Everytime there is a gathering, one cannot miss the sight of a cake amongst the dessert selection. Sometimes cakes themselves become a hot topic of discussion! We make gourmet cakes for all your get-together needs. Deep Dark Chocolate Cake – Top of the List in our chocolate cake selection because it is on top of the list from our client chocolate choice! Moist-rich dark chocolate sponge with rhum syrup – optional, frosted inside and out with Dark Chocolate Ganache, finished off with chocolate sprinkles and chocolate chips. May be filled with cherry, blueberry or strawberry preserves or nutty-chocolate cream. Black Forest Cake – light and moist chiffon layers with delicate whipped cream and cherry preserves. generously covered with chocolate shavings and sliced maraschino cherries. White Forest Gateaux – more like a flipped our black forest if we may say so ourselves! White chiffon layers with chocolate flavored whipped cream and fruit preserve of either blueberry, cherry or strawberry, generously covered with white chocolate shavings and whipped cream rosettes. Carrot Creamcheese Cake – finely grated carrots make this cake supermoist. 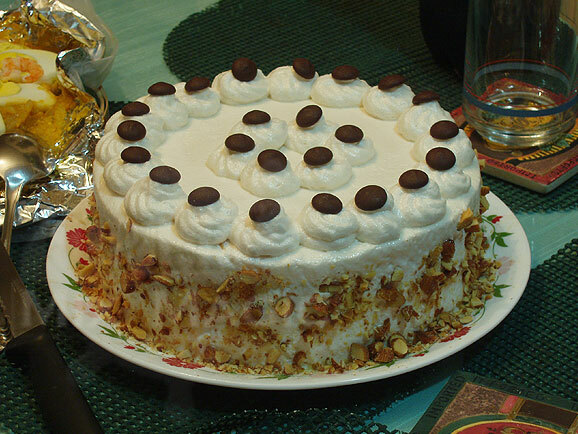 The cake is given a good quantity of chopped walnuts for added flavor and texture but the most complementing element is found on the creamy cheese frosting in each bite. Definitely a cake for those seeking to eat cake with less the guilt. Banana Chocolate Chip – ripe bananas take center-stage in each slice of this cake supported by the crunch of nuts and chocolate chips. This cake may be ordered without icing or with any icing of your choice. Cappuccino Butter Torte – Thick and creamy cake slice for all coffee-lovers out there. Rhum in icing and syrup is optional. Fresh Fruit Chiffon Cream – White cake filled with custard cream and fresh fruit slices in season. The cake is covered with whipped cream with your choice of sweetness level and more slices of fresh fruits. Rhum Fruit Cake – the staple gift this coming Christmas Holidays! We need ample time to make this so confirm your orders at least 3 weeks before you need them. …all these and many many more. We can also make cakes by request! Describe the cake you want and we make them for you! Gourmet Cakes are delivered packed and ready for gift-giving, so you don’t need to worry about tags and ribbons for your special giftee!